Also serving communities of Revere, Everett, Malden. There are 35 Assisted Living Facilities in the Chelsea area, with 3 in Chelsea and 32 nearby. To help you with your search, browse the 152 reviews below for assisted living facilities in Chelsea. On average, consumers rate assisted living in Chelsea 5.0 out of 5 stars. Caring.com has helped thousands of families find high-quality senior care. To speak with one of our Family Advisors about assisted living options and costs in Chelsea, call (855) 863-8283. Chelsea's Recreation & Cultural Affairs Division offers a range of free and low-cost programs for people of all ages, providing area seniors with enhanced opportunities for socialization and activity. Chelsea is home to three assisted living residences, as assisted living facilities are known in Massachusetts, with another 104 in nearby communities such as Quincy, Danvers and Brighton. These assisted living facilities all provide room and board in a secure residential setting. They also offer seniors the personal care services they need, providing assistance with medication management, dressing, bathing and grooming. The cost of living in Chelsea is 34.6 percent higher than the national average, although it's significantly lower than the cost of living in nearby Boston or Cambridge, making the area an economical choice for seniors wanting to remain in the region. The Chelsea and greater Boston area is home to world-class medical facilities, including Massachusetts General, Brigham and Women's Hospital and Beth Israel Deaconess Medical Center, in the event of medical emergencies or illness. Chelsea weather tends to be hot during the summer, though sticky summer heat is often mitigated by refreshing breezes off the ocean thanks to Chelsea's seaside location at the top of Boston Bay. Winters are cold, with heavy snow and rain as well as seasonal "nor'easter" storms blowing down the coast, so seniors may not be able to enjoy outdoor activities year round. Chelsea has an array of community resources for seniors, including the city's Elder Affairs Division, an organization that provides seniors with help with health insurance issues and offers exercise and arts classes through the Chelsea Senior Center. The Massachusetts Bay Transit Authority serves the people of Chelsea with seven local bus lines, and Chelsea is also a stop on the Newburyport/Rockport line of the MBTA's commuter rail line. Seniors can travel at reduced prices with a Senior CharlieCard. Assisted Living costs in Chelsea start around $0 per month on average, while the nationwide average cost of assisted living is $4,000 per month, according to the latest figures from Genworth’s Cost of Care Survey. It’s important to note that assisted living rates in Chelsea and the surrounding suburbs can vary widely based on factors such as location, the level of care needed, apartment size and the types of amenities offered at each community. Financial assistance may be available from federal and state programs to help eligible seniors in Chelsea pay for their assisted living residence fees. 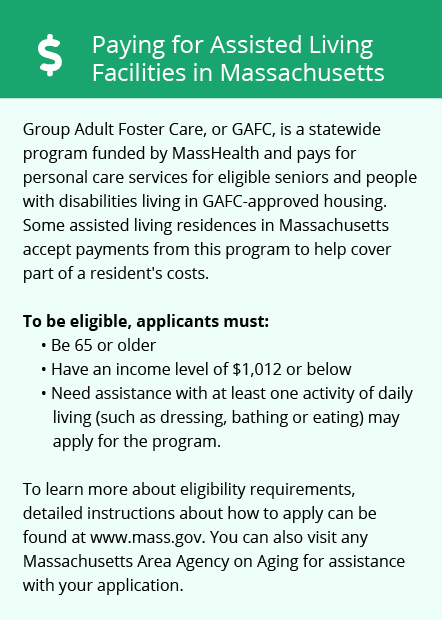 Group Adult Foster Care and the Senior Care Option are government programs available through Medicaid and Mass-Health. Chelsea and the surrounding area are home to numerous government agencies and non-profit organizations offering help for seniors searching for or currently residing in an assisted living community. These organizations can also provide assistance in a number of other eldercare services such as geriatric care management, elder law advice, estate planning, finding home care and health and wellness programs. To see a list of free assisted living resources in Chelsea, please visit our Assisted Living in Massachusetts page. 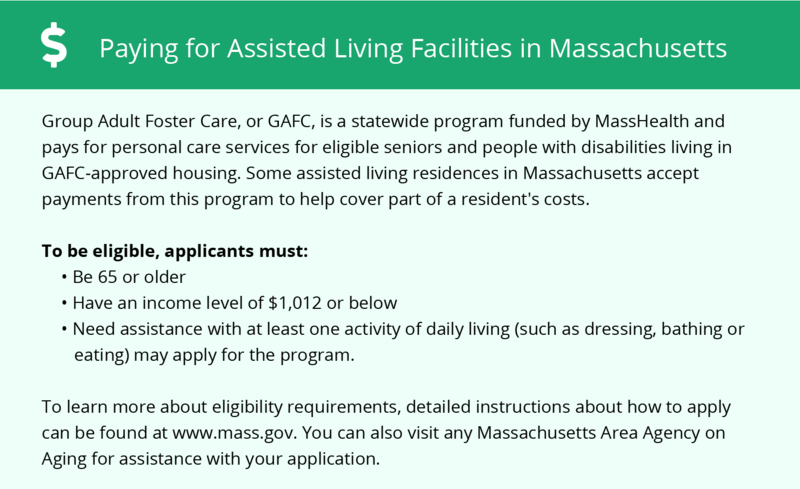 Chelsea-area assisted living communities must adhere to the comprehensive set of state laws and regulations that all assisted living communities in Massachusetts are required to follow. Visit our Assisted Living in Massachusetts page for more information about these laws.